Men who leave Sandra Bullock are idiots. But men who leave her on the Ricki Lake show are even bigger morons than the rest. I mean, come on Bill, look at her. She’s Sandra freaking Bullock. Forrest Whitaker directs romantic comedies. I’m not entirely sure how this fact escaped me for so long, but it did. And when I read his name in the opening credits, I was pretty surprised. But kudos to you, Mr. Whitaker. You’ve done good with this one. Adele is not the first person to sing “To Make You Feel My Love”. Why was I dumb enough to think that a girl who sings only moody, depressing songs could also have been the one to start a song so beautiful. Nope, that was Bob Dylan. And it tugs at my heartstrings. And everyone and your mother has covered it, in this film alone it was covered by Garth Brooks and Trisha Yearwood. I love it. When characters in films cry – I cry. No matter how bad the film is, I can get pretty darn emotionally attached to the characters. And the grandmother in this movie was so southern and fantastic. So yeah, I cried with Sandra Bullock. Despite living in a big city, I will always long to live in a small town. And a small southern town? Come on. Welcome to my weak spot. I call it the Gilmore effect. I became lovingly attached to Stars Hollow and the idea of living in a town where you know everyone’s name and everyone’s business. I’m not sure what that says about me. Harry Connick Jr. when going by his last name, does not include the “Jr.” part. This is unimportant, but it was something I noticed in the ending credits. And yes, I watched the entirety of the ending credits. They kept calling him “Mr. Connick”. I wonder if he reads that and imagines they’re referring to his dad. I will always be drawn into a terrible movie at midnight if given the chance. That’s right, this is NOT a good movie. Not by normal people’s standards. But I loved it. I’ve watched it several times now and will continue to watch it in the future. Thank you Netflix for basically being the TBS to my cable free world. Sure, it’s no “The Patriot”, but it’ll do. PS – I apologize for my absence. Not that you noticed. But I got caught up in moving a few months ago and realized what a hard habit blogging was to break back into. 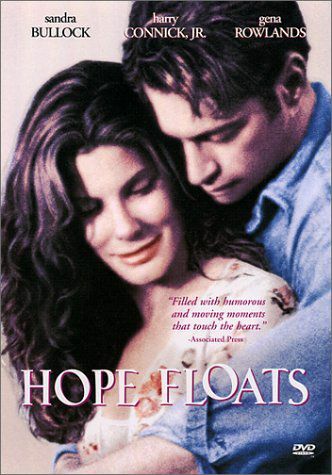 So you can thank Hope Floats for that as well.